Witness the world's finest throttle locks produced by world renowned Throttlemeister. In case you are not familiar with the product, it is essentially a bar end, mechanical, cruise control for motorcycle. Tired of a numb throttle hand? Ready to stop and rest your hand after less than an hour in the twisties? Stupid question, huh? Here's the first and only solution, my friends for when the road turns straight, boring, and painful. IMHO a Throttlemeister is the most important and useful accessory you can add to your sport bike. I have one on all my bikes. Pirates Lair offers kits for the BMW K1300S, K1200S, K1200R, K1200R Sport, S1000RR as well as kits for the venerable BMW K1200RS. For the 1998-2004 K1200RS, we offer a black or silver standard heavy version as well as special orders upon request. 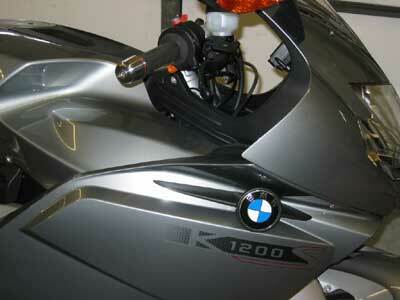 The K1200RS standard heavy version works fine with or without heated grips. Expect about a 1 week wait for our RS version. 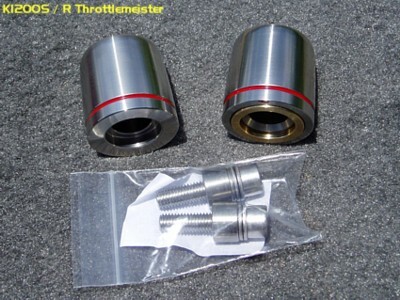 Throttlemeister makes TWO versions for the K1300S, K1200S, K1200R, and K1200R Sport.. BOTH work with the heated grips. We carry only the short version in Silver and Black for those bikes. They work the same.. We sell the heavy version for the K1200RS because it "looks" right on that bike. Some prefer the weight of the heavy version but IMHO it just doesn't look as good on most bikes. However, we can special order the long/heavy version for an additional $25. 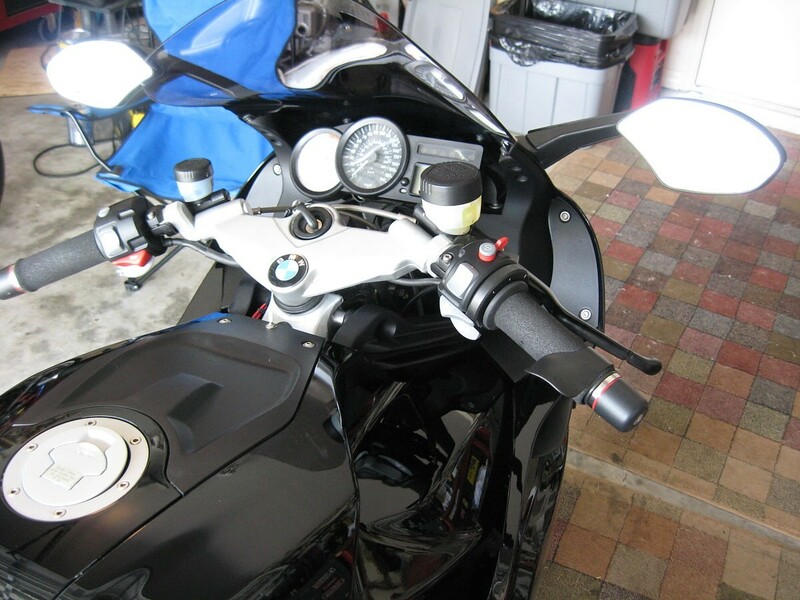 Lastly..Our S1000RR Throttlemeister is compatible with heated grips. Machined from bulletproof billet stainless steel & ampco bronze, your Throttlemeister will maintain it's smooth and solid operating feel for years to come. The inside is sealed by "O" rings to keep out dirt and water so there is no need to worry about rust and/or corrosion. These are virtually maintenance free.. No need for any lubrication.. ever. and another perk.. they actually look good on the bike! Once you've mounted the Throttlemeister bar ends to you bike, they work like this... All of the workings of the Throttlemeister are inside the bar end itself. Once mounted, you turn the whole bar end in the same direction as opening the throttle. A piston moves in and out of the Throttlemeister itself and puts friction against the throttle tube which in turn, counteracts the throttle return spring. When installed properly, the Throttlemeister will not completely lock the throttle, you can always override it in any situation. If you need to stop quickly you can just grab the throttle and turn it off. It can even be operated wearing heavy gloves. Install: How hard is it? It's about a 15 minute/ 1 beer job using basic tools. Bottom line...this is a solution to a serious problem for some us us. After one long ride I was spoiled and now, like my radar detector, I couldn't do with out it.. Trust me.. you're gonna love the difference this affords you for every day street or touring riding. Aftermarket Bars Compatibility: K1200S, K1300S, S1000RR, HP4 Throttlemeisters are compatible with Verholen risers, Heli-Bars, and IDI Designs Risers. Warning!!! As with any part or accessory on a motorcycle, improper installation and/or use of the Throttlemeister could cause SERIOUS INJURY or DEATH. Riding a motorcycle is a inherently dangerous activity, and as such should be treated with utmost respect. The Throttlemeister should never be used by inexperienced riders. Before riding, become acquainted with the operation of the Throttlemeister. Inform anyone who is going to use your cycle that the Throttlemeister is installed and how to disengage it. Do not use in traffic. Do not use in a residential or urban area. Do not use in any situation where precise throttle control is needed. Never take your hands off the handlebars. If you have any reservations about using the Throttlemeister please return it to us for a full refund. 3/01/19: Here ye.. Here ye.. We just found out that Throttlemiester has closed their doors and the business is for sale.We are reluctantly having to discontinue all their products effective immediately. BMW K1300S / K1200S / K1200R Throttlemeister SILVER $145.US (USPS Priority Included) Unavailable as of 2/14/19! BMW K1300S / K1200S / K1200R Throttlemeister BLACK $155.US (USPS Priority Included) Unavailable as of 2/14/19! BMW S1000RR Throttlemeister SILVER $145.US (USPS Priority Included) Unavailable as of 4/10/19! BMW S1000RR Throttlemeister BLACK $155.US (USPS Priority Included) Unavailable as of 2/14/19! 1998-2004 BMW K1200RS Throttlemeister Standard Heavy / SILVER $160.US (USPS Priority Included) Unavailable as of 2/14/19! 1998-2004 BMW K1200RS Throttlemeister Standard Heavy / BLACK $170.US (USPS Priority Included) Unavailable as of 2/14/19!